I realise that it’s a bit late for a left-over turkey recipe but here it is anyway. Just as good with leftover roast chicken! Over a medium heat, fry the bacon lardons in a tiny bit of oil until their fat is released and the bacon is crispy. Remove from pan and set aside. Add the leek and thyme to the pan and fry in the bacon fat until the leek has softened. Remove from the pan and set aside with the bacon. There should be approximately a tablespoon of fat in the bottom of the frying pan. Add another tablespoon of oil then the flour. Stir to form a roux. Gradually add the hot stock a ladle full at a time (stirring well to remove lumps) until a thick clear gravy forms. Add the turkey, leek and bacon to the gravy and simmer for 10 mins. Season carefully. Spoon the stew into an appropriately sized casserole dish and top with puff pastry. Bake for 25 mins in a 200 oC oven until the pastry is golden and crisp. Sometimes I prefer to cut the puff into squares and bake it separately on an oven tray to make it extra crispy. This looks absolutely, wonderfully delicious! Well done. Hmmmm, looks good 🙂 Just last night I was asking hubby what we should do with 2 batches of homemade shortcrust pastry that I still have in the freezer. The answer he gave was simple: Piiiieeeeee! Although I’m leaning more towards making small/individual beef wellingtons. Anyway, may give your recipe a go! Never too late! We’ve still got some frozen turkey in the freezer – I used some last night in a delicious thai curry and I used another lot in a pie with leftover Christmas ham and leeks. Delicious – like the idea of using pancetta. Bacon and puff pastry? Yes please! Gorgeous! And perfect, perfect for the new snowstorm we’ve just had! Wow…want to eat the photo! Gorgeous pie with delicious filling. I wish I could have it for tonight’s dinner! perfect for a cold winter’s day – like today! and yes, chicken works perfectly here as well! 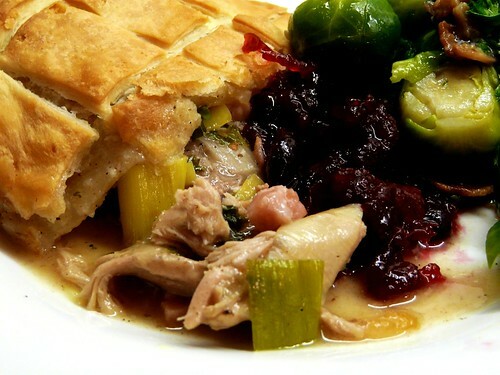 This looks good, I love winter, as pies just come into their own!